UV, or ultraviolet, disinfection is a type of water treatment that uses ultraviolet light to make certain contaminants safe to drink in your Coachella Valley area water. Most commonly used to disinfect water contaminated with bacteria, UV water treatment is also used to target specific contaminants in water supplies, as it effectively disinfects up to 99% of waterborne microorganisms. Because it can eliminate diseases like giardia and cryptosporidium that chlorine alone can miss, UV water disinfection can provide an extra layer of safety for water supplies. Treatment works by exposing water to ultraviolet light contained in specialized tubes, which effectively scrambles the DNA of harmful bacteria and microorganisms. As a result, UV disinfection is a fast, if expensive, way to disinfect water. UV treatment began in the early the 1930s, when tubular lamps allowed the expansion of UV light technology. As it developed, the applications for water disinfection became apparent, and UV disinfection was used regularly in the 1950s and 60s. Primarily contained to commercial markets in the early stages, it’s becoming more accepted for residential applications as an effective alternative to chemical-based water treatment. 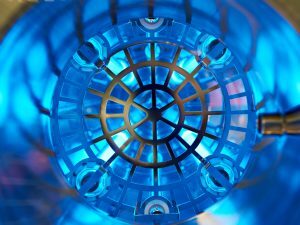 UV disinfection has practical applications for commercial as well as residential water treatment, though it has primarily been used in commercial settings as a result of its cost. Many industries, like hotel chains and restaurants, use UV water treatment to ensure water is safe for their guests, and has the best quality and taste for everything from prepared beverages to spas and swimming pool experiences. For those willing to spend the extra money, UV water treatment can provide an effective method for residential home water treatment. Especially applicable for homes and communities that primarily source well water, UV disinfection can effectively protect against bacterial contamination that can be common in well water due to runoff and seasonality. Fresh-tasting drinking water: treating water without chemicals or salt means water tastes more pure, and more delicious, than ever. Ready to learn more about UV water treatment? Your Coachella Valley area Culligan Man can help you better understand the technology and whether or not it could make sense for your home or business.